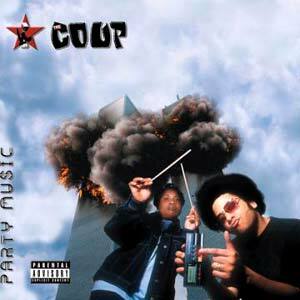 After 9/11 The Coup changed this cover (CLICK TO READ VH1 ARTICLE) . "The 12-cut Party Music brims with charged political messages. It remains consistent with the Coup's earlier funk-inspired work, which is largely shaped by Boots, a self-declared communist and community activist. The cut also makes a statement about the current level of hip-hop activism." JDS' Note: We all know about First Amendment Rights (which even gives "We The People... Rule!" air). And, we all know that often "life often imitates 'art'" (I placed 'art' in quotes because I wish not to grace anarchy or communism)... BUT ONE HAS TO HAVE AN UNEASY FEELING THAT SUCH A GRAPHIC IMAGE AS THE COUP'S CD COVER MAY... JUST MAY INSPIRE, OR AFFIRM SUCH A TWISTED ATTACK AS THE ONE ON WORLD TRADE CENTER. The track "5 Million Ways to Kill a C.E.O." examines the upper class' unquenchable greed, while "Get Up" rallies for a revolution against what Boots and guests Dead Prez say is a corrupt U.S. government.